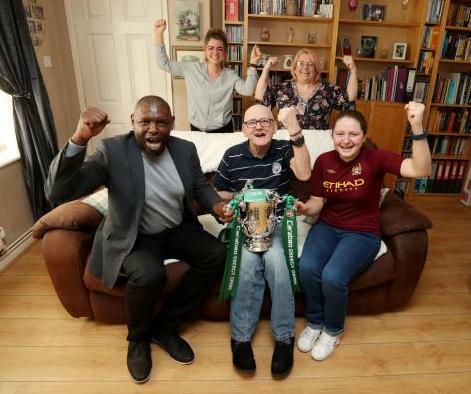 A Manchester City legend paid a surprise visit to one of his biggest fans and hand delivered tickets for the club's Wembley League Cup final visit. In a report posted by warringtonguardian.co.uk Shaun Goater is one of Peter Bretnall's all-time favorite players from 60 years of following the Citizens. And on Wednesday, February 13th, the Bermudian striker visited his Orford home - bringing a pair of tickets to Man City's League Cup final clash with Chelsea with him. The surprise was organized by the 76-year-old former bus driver's daughter and fellow City fan Holly. Emily Bretnall, another of Peter's seven children, said: "It was a complete surprise - my dad was expecting it to be a social worker, and then he obviously answered the door to Shaun. "He's a massive fan - he's probably been a supporter for 60 years. "Shaun was here for two-and-a-half hours chatting with my dad - he spent all morning here, and he's a really nice guy. "He was lovely, polite and really thankful.